Open_toe leather wedges in black. Strap at cutout upper overlaps at 1 platform. Knotted multi_straps at cutout shaft. 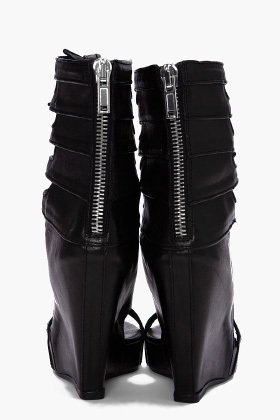 Exposed zip closure at back. Leather sole with approx. 4.5 covered wedge heel. Long sleeve pebbled leather jacket in black. Stand collar. Off_center exposed zip front. Concealed zip pockets at waist. Zip up cuffs. Wool_blend trim at underarm. Asymmetric hem. Lined. Tone on tone stitching.